Goodbye has been on the road finding adventure, inspiring green options, and business inspiration. March 18th I was in Whakatane with my friend and life coach Cindy Powers Prosor, who graciously gave me and Goodbye an entire day of support to run a stand at the Spirited Women Adventure. What a brilliant day, and we met so many motivated, switched on women. There were 400 teams of 4 women each-the event gets sold out every year months in advance. 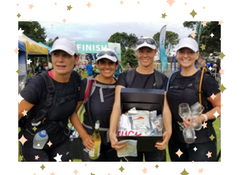 Here’s info on the Spirited Women Adventure Race to keep in touch and see where it will be next year. Special thanks to Team Peninsula Yoga and SUP (pictured), who won our Goodbye box of goodies. April 7th and 8th in Auckland at the ASB Showgrounds on Green Lane, Auckland was the Go Green Expo. If you have a green, healthy, sustainable leaning in your life, this show is very good value. You’ll find many of your favourite brands there, and see more that make you smile. Last year I got to meet Tom from Tom and Luke’s Snackaballs and Robert from PureBread. This year it was all about Rebekah’s Hakanoa Ginger Beer and everyone wanted a steel lunchbox from Meals in Steel. We asked people to vote on Goodbye OUCH packaging. The heady question of tube or tin was answered by over 300 people. Tell us which you prefer on Facebook or Instagram. On Saturday the 7th I gave a talk to a packed room called Slow is Fast: Using the Energy of Flow to Get Things Done. It was lovely to hear everyone’s comments when they came to the stand afterwards. I look forward to sharing it with you in a future post. April 9th in Auckland I went to the flagship year of SheEO in New Zealand (it also runs each year in the US and Canada) and I am delighted to be involved. The top 8 NZ ventures chosen from over 100 applications. We’ve already voted again and the top 5 were announced April 9th at the meeting. It’s great to be collaborating with like minded business women. Here is information about the program and becoming an Activator. It has been a busy few months and I am very excited to share our next adventure with you soon! Next articleOur Natural Sun Balm Has Arrived!